I have been doing CrossFit for almost 3 years, starting with Climate CrossFit. I was definitely nervous to start, but I had a few different motivations. First, I have known Coach Tony forever, so knew that the coaching would great. But I started CrossFit after I had to buy new (bigger) work clothes because nothing seemed to fit anymore. Bryan and I had been dating for a few years and we had gotten comfortable. It was time to get back into a fitness routine. Not particularly. I played volleyball some during school, but not at a competitive level. I’m not sure I can choose one, because there has been so many little accomplishments. My first pull up, first RX work out, first time stringing 20 double-unders together, first competition. All may seem small, but all big accomplishments in their own ways. Either 5:00am or 5:30pm, depending on how many times I decide to hit the snooze button. Just all around health is better, I can feel it everyday. Personally, prior to CrossFit I had migraines at least once a month; I’ve been participating in CrossFit now for almost 3 years and can count on one hand how many migraines I have had since starting. It may not be directly related to CrossFit, but I think it’s a big reason behind it. Being with family and friends. Bryan and I race cars and love being active outside with our dog, Zoey. Spaghetti squash with ground turkey and spinach. Ice cream. That’s a meal, right? There are still lots of things I’d like to be better at, which makes CrossFit so much fun. Little victories are awesome! Currently, I’d like to string pull ups and more double unders together. Cleans and Snatches are always fun when you hit the movement right. I like kettlebell movements and working on gymnastics. 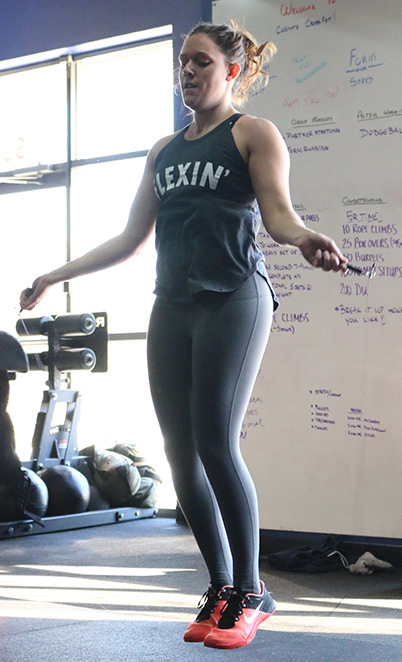 What would you tell someone who is on the fence about trying CrossFit and/or Barbell Club? Come to a free Saturday class! Try it out. The community is amazing, the workouts are challenging but great, and the coaches work with each member individually so you’re never trying to figure it out on your own. I bet you’ll end up loving it.